T2K measures the oscillation parameters of muon neutrinos by using a near and far detector positioned in the J-PARC muon neutrino beam. The near detector also has an independent physics programme e.g. measuring neutrino interaction cross sections. The J-PARC accelerator chain begins with two Linacs feeding protons into a 3GeV synchrotron. These are sent either to a neutron and muon facility, for materials and life sciences, or passed on to be accelerated further in the 30GeV main ring. In addition to a variety of hadronic experiments, it is this ring which is used for the generating the T2K neutrino beam. With a design power of 0.75MW the proton beam is directed onto a graphite target. Collisions in the target generate pions and kaons which are then selected and focused by three magnetic horns with fields up to 2.1T and directed down a 98m decay pipe in which they decay to produce a beam of predominantly muon neutrinos (there is a small background of electron neutrinos from kaon decays and secondary decays of muons ~4%). At the end of the decay pipe is the muon monitor: a 7x7 grid of ionisation chambers, which give the experiment a handle on the beam production rate. T2K is the world's first "off-axis" neutrino experiment, with the near and far detectors both placed 2.5° off the beam direction. Placing the detectors off-axis means that they only see neutrinos with a much reduced spread in energy which reduces potential backgrounds in the far detector. 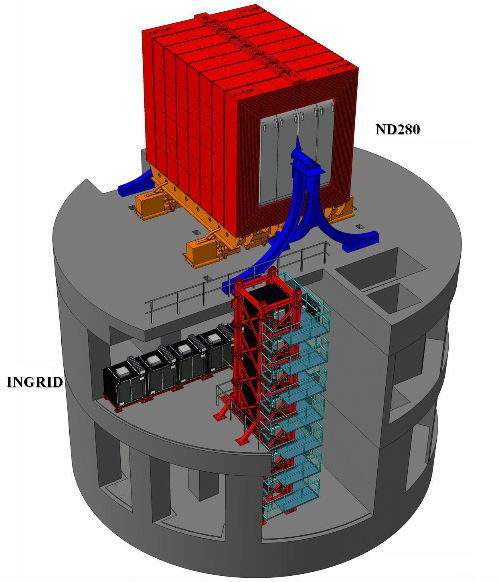 ND280 is a hybrid detector, responsible both for measuring the initial neutrino flux from the beam and for making neutrino-nucleon cross-section measurments (essential for predicting the expected flux at the far detector). Downstream of the P0D is the "tracker": three Time Projection Chambers (TPCs) seperated by two Fine Grained Detectors (FGDs). The TPC makes high-resolution momentum measurements from curvature in the magnetic field of particles produced in the FGDs which are scintillator-only detectors for good position resolution. The first FGD uses the carbon scintillator as its target mass while the second FGD contains six water targets. Comparison of the interaction rates between the two FGDs enables the (predominantly scintillator) ND280 measurements to predict the (water) interaction rate at Super-K. 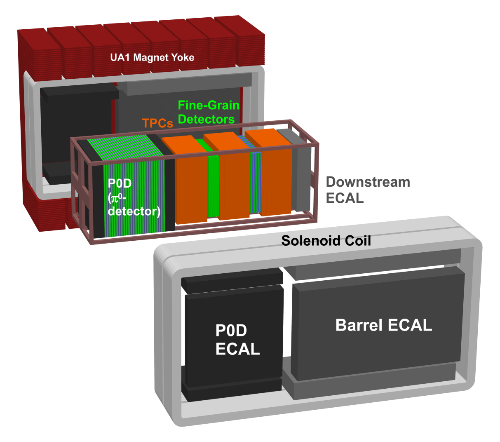 The most downstream module in the basket is the Downstream Electromagnetic Calorimeter (ECal). It's primary responsibility is to catch high-momentum tracks escaping the tracker to reconstruct their energy/momentum. The basket is entirely surrounded by the Barrel (around the tracker and downstream ECal) and P0D ECals, each of which is composed of six (two side, two top and two bottom) modules. Though the ECal detectors are similar in many respects there are some differences in construction. The Barrel ECal will assist in the reconstruction of tracks escaping the tracker at high angles, while the P0D ECal, which is too small to reconstruct tracks/showers, will catch escaping pi-zeros which have not converted in the P0D and veto incoming particles. Construction of all six P0D ECal modules took place here, at the University of Warwick. Finally, gaps in the magnet are instrumented with large scintillator "paddles".The Side Muon Ranging Detector (SMRD) tags outgoing muons as well as vetoing incoming cosmic rays and particles from rock-neutrino interactions. INGRID is a beam monitoring and profiling detector consisting of seven vertical and seven horizontal modules which combined form a cross centred on the beam axis. Each module is constructed of layers of iron and scintillator, which are read out using the same fibres, photosensors and electronics as the ND280 ECals. It is placed upstream of the ND280. Super-Kamiokande (Super-K) is probably the most famous experiment in the history of neutrino physics. Originally built to search for proton decay, it played a significant role in the discovery and study of both solar and atmospheric neutrino oscillations. It has also served as the far-detector for the K2K oscillation experiment prior to being part of T2K. Super-K is sited near Kamioka, around 300km west from the T2K beamline at J-PARC, in a disused mine under Mount Kamiokako which acts to shield it from cosmic-ray muons. The experiment itself is a 50,000ton water-Cherenkov detector surrounded by over 10,000 photo-multiplier tubes (PMTs). 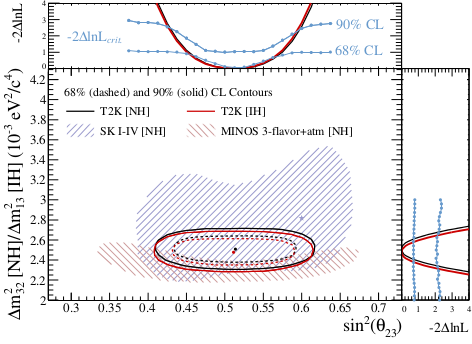 By profiling the Cherenkov rings it can differentiate muon-neutrino and electron-neutrino induced interactions and provides the vital directional information required to select neutrinos originating from T2K. In 2011 T2K was the first experiment to see an indication of electron neutrino appearance from a muon neutrino beam. This award winning publication has now acrued well over 1000 citations. With the accumulation of more data, the statistical significance of this result increased first to the 3 σ and then past the 7 σ level, firmly establishing the non-zero value of θ13.